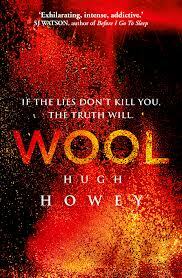 Wool, by Hugh Howey, is one of those rare, feel good stories in the history of self publishing. Beginning as a self-published short story in 2011, "Wool" was originally released to little fanfare. Slowly but surely, word of mouth spread, and readers and reviewers demanded more. Howey released subsequent sections serially, taking reader feedback into account, and grew his self-published short story into the New York Times Bestseller it is today. The book has been published internationally, and the film rights have even been optioned by Ridley Scott and Steve Zaillian. Even before the book was published by Simon & Schuster, it had already sold more than 400,000 e-books and had been optioned by Hollywood. What a year for a self-published author! I must admit, I came late to the party. I would have never even read Wool had a good friend not passed along her copy to me. But boy am I glad she did. Wool is the most memorable story I have read all year, and perhaps the best work of post-apocalyptic science fiction I have read in at least the past few years. The story takes place in a post-apocalyptic dystopia, one in which the outside air is too toxic and contaminated to breath. Humanity lives in a huge Silo, one that descends 144 levels deep into the earth. Naturally, the residents of the Silo have built their own traditions, culture, and even religion predicated on the fact that they are the only ones in existence. Yet the culture of the Silo, we find, appears to be almost wholly statist and stratified, with each group serving its particular functions. The machinists, miners, and hydroponic farmers operate mostly in the lower third of the Silo, deep underground. The information technology group is located in the Silo's heart, while the Mayor, the Sheriff, and the official leaders work at the very top. The Silo is wholly self-sufficient, producing what it needs and strictly controlling the population to ensure group survival. Only with someone's death, can a new life be brought into this harshly controlled world. Any mention of the world outside the Silo is wholly forbidden. And stating a desire to go outside is a death sentence. In a ceremony poignant with meaning, those convicted of wanting to go outside are given their wish: the are forced to leave the Silo and serve as cleaners. They don a bulky protective suit, and use industrial-grade wool cloth to clean off the outside sensors. But unfortunately for the cleaners, the Silo is unable to create suits that can get the cleaners back into the Silo alive. This is humanity's future dystopia. A bleak one indeed. Wool presents a central mystery, one from which the story's wheels start spinning. Despite the fact that cleaning is a death sentence, each and every cleaner nonetheless methodically cleans off the sensors before succumbing to the toxic environment outside. Why, with this assured death sentence, do they do their jobs without fail? Why not resist, or refuse? The story takes shape from this central mystery. And the answer takes the reader deep within the Silo, into the depths of its working machinery, into the intriguing existence of IT in a world that doesn't seem like it should support such technology, and into the far reaches of its political and cultural life. Of course, to get deep within the Silo, the reader must travel down vast, spiraling staircases, as the Silo made room for no elevators. At first, this struck me as odd and rubbed me the wrong way. But midway through the book, it becomes obvious as to why the Silo's floor plans include no elevators. The difficulty of traveling through the Silo is what makes the adventure so much more interesting, and the cultural and political differences between sections of the Silo more believable. Toward the end, the book becomes somewhat predictable, and the ending leaves a bit to be desired. Nonetheless, Howey presents likable characters making the most of (or sometimes going crazy in) their dystopic, difficult-to-imagine environment. In the process, he tells what might otherwise be seen as a tale of the morality of immorality, and the difficulty of removing the wool once it has been pulled over one's eyes. I dare not say more about the plot. Doing so would ruin the excitement that this book provides. Read, and discover for yourself. Penalties: -1 for always making me think, "why are there no elevators in this silo"?